Bob is an award-winning novelist & outdoors writer. He has also penned a fishing handbook and a hunting handbook. He is currently working on a bowhunting book. After a day's fishing, it's nice to come home in the afternoon and just relax on the deck or patio with a beverage and a light bite to eat before preparing dinner. However, that respite is often interrupted by annoying bands of bugs that want in on your territory, food, and beverage. The unwelcome winged pests are persistent as you wave away, swat, smack and curse those critters. In a July report, I addressed the issue, reviewing the Thermacell MR450 Mosquito Repellent product, a godsend for the serious outdoorsman. The unit is geared toward fishing, hunting, and other outdoorsy activities in that it is easily carried on the person via a belt clip or a secondary clip attached to the unit's carrying case itself. I found the product practical when used on the back deck at home as well. However, I found an even handier Thermacell product for use around the home. We live on the water on Long Island; a stretch of phragmites line the shoreline but forty-two yards from our back deck. This should give you a clear picture of what the bug population can be like, especially on hot humid days and/or when our planet is tilting toward a westerly horizon. Bugs abound! Mosquitos the size of buggies, or so it seems, bite and make your day miserable. What to do. Back home when lounging around, and before thoroughly researching Thermacell products, I'd have to change out of shorts and T-shirt then don light, long sleeve shirts and trousers in white or khaki (two colors that help, somewhat, deter those pesky creatures). Black and blue colors attract mosquitoes like a magnet. I'd spray my cap with bug repellent, reluctantly my neck, hands and wrists. Still, several of those [email protected]#$%&* [buggers] would always get me good. Too, I'd spend a small fortune on a circular parade of citronella candles. From the moment I brought the Thermacell MR450 Mosquito Repellent product from field to home, setting it up on our deck table or a neighbor's patio when invited for dinner, life was good. I then researched and found another Thermacell product specifically designated for the backyard, deck area, patio, et cetera, referred to as the Thermacell Patio Shield. It is a convenient way to have mosquito protection on hand without having to borrow from Peter to pay Paul, meaning not having to go into and remove the MR450 unit from my organized tackle box or hunting paraphernalia. In other words, a place for everything and everything kept in its place. Now, I simply reach for the Thermacell Patio Shield unit kept on a shelf in the vestibule on my way out to the back deck. Good to go. 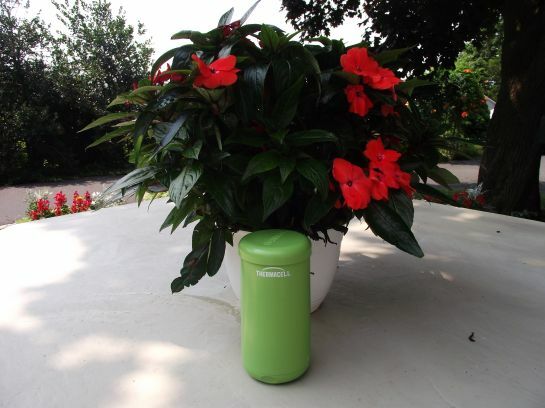 The Thermacell Patio Shield unit uses the same propane cartridges and mats as Thermacell's MR450 Mosquito Repellent product. The heat-activated mats release the insect repellent (active ingredient: d-cis/trans allethrin 21.97%). The repellent is a synthetic copy of a natural insect repellent found in chrysanthemum plants. Just like the MR450 unit, the Thermacell Patio Shield provides 4 hours of protection before having to change the blue mat, which is inserted beneath the unit's protective screen. This is done in a matter of seconds. You know that the mat is expired when it turns completely white. Simply slide in a new mat while pushing out the old mat. The beauty of the Thermacell Patio Shield unit, just like the MR450 model, is that it covers a 15 foot x 15 foot zone of protection from mosquitoes and flies. The weather-resistant container, comprising a protective snap-on cover, shields the repellent mat when not in use. Additionally, the unit has storage below for additional mats. The butane cartridge is good for activating three mats; hence, you have 12 hours of protection before having to insert a new cartridge. No electrical cords or batteries to worry about. Simply twist the container's base from the Off position to the On position. The propane gas will begin to flow; wait several seconds then twist to the click-Start position (no differently than my Weber barbecue). An orange glow, visible through a small circular window near the top of the unit, shows that the unit is heating up. Place the cover beneath the unit so as not to misplace it. With these two Thermacell products, enjoy a bug-free outdoor environment whether you are at home, boating, or far afield. Dicky, Richard, and I. A story of madness in the making. A curious mix of a mother's care and cruelty concerning her young son, Dicky Geist, and the precocious boy's metamorphosis into that of a multiple murderer. The Signing. An account of a clandestine murderous cult monikered the Inner Circle of Friends, led by Richard Geist. Geist and cult members are hellbent on creating chaos and bringing about the eventual collapse of our government. The Triumvirate. A tale of Neo-Nazism. Three most powerful men covertly control governments around the globe. Fifty-year-old secrets begin to surface referencing Hitler's progeny, the Manhattan Project, and Nazi gold in this mystery within a mystery. It is the genesis of the Fourth Reich. The Author. A prolific serial killer is the author and architect of a covert operation whose job it is to place government operatives within the ranks of worldwide extremist groups. Justin Barnes, a street savvy Afro-American maverick, searches unrelentingly for the madman who viciously murdered Justin's female cousin. The Teacher. Justin Barnes, working clandestinely with Suffolk County homicide detectives on Long Island, is assigned to help track down Malcolm Columba's associate, serial killer Professor Clarence Emery. The pair had worked in concert, and Justin is out to stop Emery before he strikes again. A terrifying tale of evil and what it takes to stop it in its tracks. Knots. Kalvin Matheson, an out-of-work insurance salesman obsessed with immortality and hero worship regarding two notorious serial killers, follows in the footsteps of his two diabolical pals, but with a subtle signature twist, utilizing intricate knots. The Good Samaritans. In this final four-part series, Justin Barnes, once again, assists Suffolk County homicide detectives as part of a covert operation in tracking down Sep Cramer, a politically well-connected, ruthless serial killer. Trace Evidence. 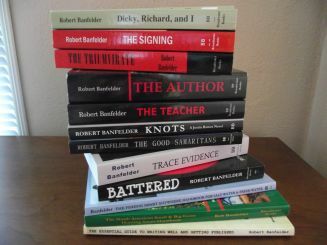 Inspired by the Robert Shulman Serial Killer Trial in Riverhead, N.Y., Robert Banfelder spent every day for 15 months as a spectator to obtain fodder for this novel. Battered. 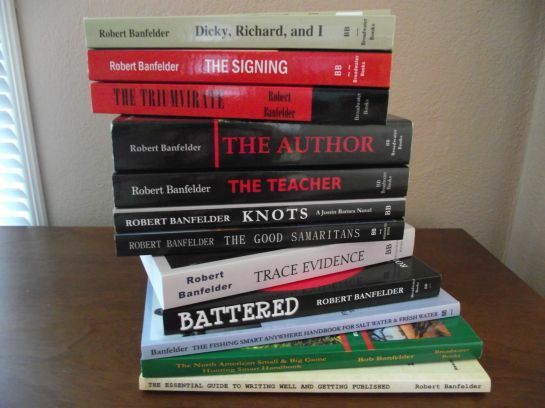 Based on a true story of an abused woman who murdered her husband, Robert Banfelder communicated with abused women, one of whom spent 15 years in prison for her crime. There is a striking resemblance among the many varieties of strike indicators on the market today. Some are comprised of cork with a rubber wedge that holds a leader sandwiched between the two materials. They may be oval or shaped like a tiny football. Some indicators are a bubble bobber-type, comprised of a hollow plastic ball with a plastic screw and washer that locks the leader in place. A popular brand-name indicator is one called the Thingamabobber that uses trapped air technology; they come in assorted sizes and colors. You simply loop the leader through its grommet. Other strike indicators utilize yarn in lieu of cork, rubber, or plastic, the leader held in place by any number of methods, knots being but one manner of fastening material and leader. Knots and/or kinks prove problematic. Too, yarn eventually absorbs water and has to be chemically treated continuously or it will sink. And then there are those sticky foam Palsa pinch-on type indicators that have been around forever. As we used foam strips to tie our winged ants and hoppers, why not stick with foam and construct your own strike indicators? 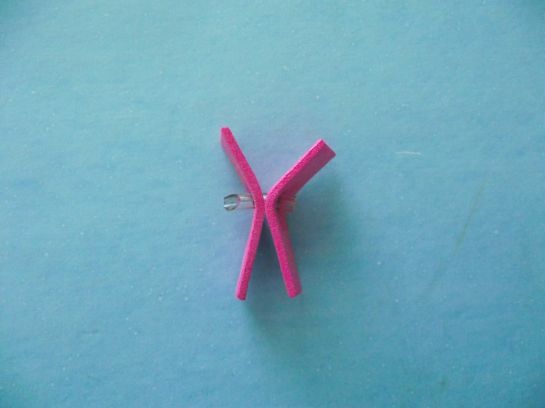 We'll make one here by using two strips of pink 2 mm foam, a ½" length of 1/8th" flexible tubing, epoxy, and a toothpick. This simple strike indicator will not knot, kink, or make a sticky mess of your leader as would several of the other strike indicators mentioned above. What's really neat about this crafted strike indicator is that you can adjust its length up and down in a heartbeat. And, yes, it will easily float those heavier 1/0 and 2/0 hooks we've been using for saltwater angling as well as smaller, lighter hooks. Step 1: Measure and cut two strips of pink foam to size; that is, 1¼" long x 3/8th wide. Step 2: Place one strip atop the other and pierce the center of the strips with the sharp point of a pencil to make a small hole. Step 3: Cut a ½" length of the flexible tubing at a very sharp angle then insert it into the hole. This facilitates insertion. Allow both ends of tubing to protrude. Step 4: Glue both strips together, right up to each side of the tubing, being careful not to allow the epoxy to touch the ends of the tubing. Allow to dry thoroughly. Step 5: Trim both ends of the tubing flush with the face of the foam strips. Step 6: Double over and pinch the leader at a point where you want the strike indicator set. Insert the folded leader through either end of the tubing, forming a small loop. Step 7: Pass the loop over and around the ends of the strips and snug down lightly, perpendicular to the embedded tubing. Step 8: Stick the narrow end of the toothpick into either end of the tubing to lock the leader, allowing ¼" of the toothpick to protrude; break off at this point. Changing depths is quick and easy. 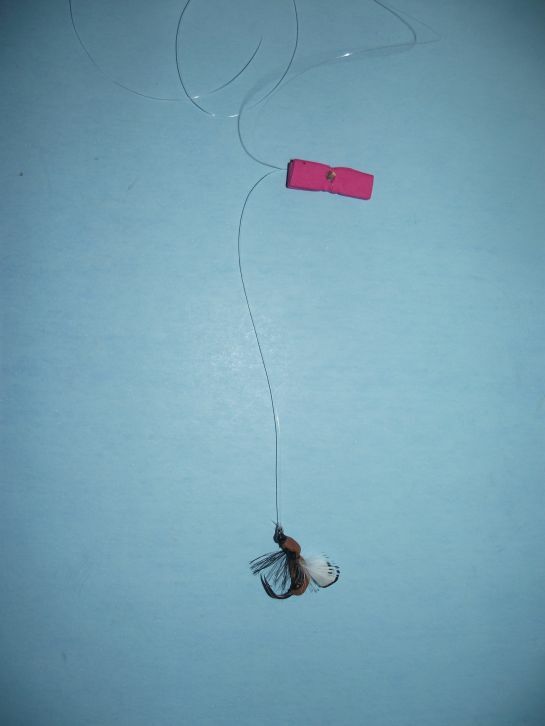 Depending on where you would like your fly suspended into the water column, remove the toothpick, loosen the loop, slide the strike indicator up or down the leader, reset and lock it in place with another piece of toothpick. Compact and cheap to construct, these strike indicators work wonderfully well with tapered and non-tapered leaders in either monofilament or fluorocarbon. Good to go. When casting light flies such as nymphs, I always use knotless tapered leaders for better turnover. Too, my choice of tippet material is almost always fluorocarbon. I'll conclude this piece by stating that employing strike indicators with wet flies will aid in catching more fish in either freshwater or saltwater. See you on the water this summer season—at least in spirit.